The Tibetan word monlam means “prayer,” “supplication,” “aspiration” or simply “good wishes.” The monastics at Ka-Nying Shedrub Ling, Asura Cave and Nagi Gompa Nunnery are engaged in continually carrying out sponsored prayers and religious services for clearing away obstacles to the fulfillment of laypeople’s wholesome wishes. These services are available to everyone all over the world through our monlam website. There, one can easily request and sponsor the recitation of Buddhist prayers or the performance of special religious services [pujas] to support the monastic sangha, to help engender world peace and prosperity, to create the positive circumstances needed for fulfillment of one’s personal wishes and to dispel obstacles hindering the happiness, prosperity, good health and well-being of loved ones. 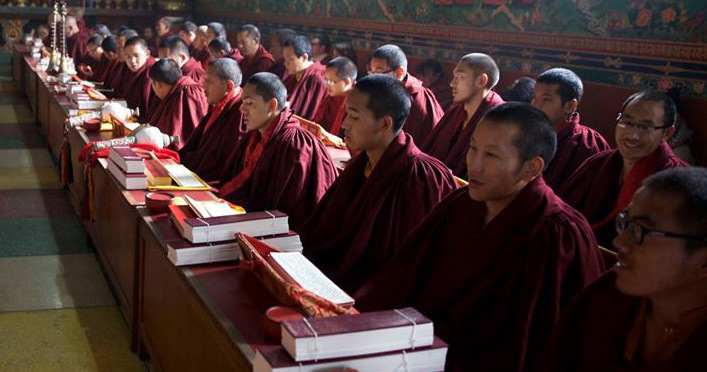 In addition to contributing toward the fulfillment of your own wishes, your donations help support the monks and nuns who recite these powerful supplications and perform special pujas by request. Offerings made toward the expense of carrying out major pujas on the Buddhist high holy days generate a great deal of merit for the benefactor and are especially effective for removing obstacles. Rest assured that all contributions go directly to supporting our monasteries and nunneries.